Sold by his parents to the Queen of the s'Hisbe as a child, Trez escaped the Territory and has been a pimp and an enforcer for years. On the run from a destiny of sexual servitude, he's never been able to rely on anyone...except for his brother, iAm. iAm's sole goal has always been to keep his brother from self-destructing -- and he knows he's failed. It's not until the Chosen Selena enters Trez's life that the male begins to turn things around...but by then, it's too late. The pledge to mate the Queen's daughter comes due, and there is nowhere to run, nowhere to hide, and no negotiating. 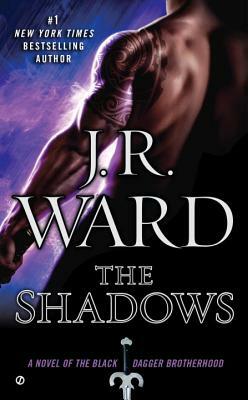 The Shadows is the thirteenth book in the Black Dagger Brotherhood series by popular American author, J.R.Ward. Shadow Trez Latimer’s birth saw him declared the Anointed One, meaning a life imprisoned as mate to the s’Hisbe Princess, heir to the throne. His escape from the Shadow Territory could only see him avoiding his fate temporarily: even his promiscuous lifestyle, an attempt to contaminate his body’s purity, would not reprieve him. That same lifestyle ensured that when he met the Chosen, Selena, despite their mutual attraction, he knew he could never be worthy. But a sudden life-threatening disease forces the issue: Trez and Selena are thrown together. His twin brother, iAm, in an attempt to help his brother out, risks travelling to the Territory to seek vital knowledge. While there, he is stunned to find that he wants to give up his lifelong celibacy for a serving girl, a maichen. Meanwhile, Chosen Layla is still meeting secretly with the sworn enemy of the King and the Brotherhood, Xcor. But Xcor’s distraction with Layla sees murmurings of mutiny in his Band of Bastards. And Assail has to reconsider his choice of business partner.